With so much misinformation being written about liposuction and body sculpting in general, Dr. Victoria Karlinsky decided it was time to provide the FACTS for those considering body sculpting. THE FACT: Liposuction is not designed for weight loss. Rather it is intended to re-contour areas of your body where fat is resistant to diet or exercise. Liposuction can be performed anywhere on the body. The most popular areas include the arms, stomach, back, and thighs. THE FACT: If you overeat, fat will return but it will be distributed differently and, most likely, stored in other areas of your body. My advice to patients is to protect your investment in improving how you look and feel…and eat wisely to maintain your beautiful new figure. THE FACT: While there may be some mild discomfort after your treatment, we perform the most advanced and modern-day liposuction at New Look New Life Cosmetic Surgical Arts, which is not painful. 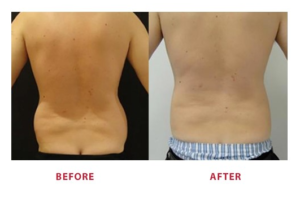 In fact, we offer “Lunchtime Lipo” when only one area is being treated where patients can go right back to work. With treatment of multiple areas, you can resume your normal activities after a few days. THE FACT: Liposuction used to require long-term compression garments but not anymore! Today, I recommend patients wear a compression garment for one-week day-and-night and another week part-time and then taper off. THE FACT: When one or two areas are being treated, local anesthesia is recommended. For multiple areas, I do use general anesthesia. THE FACT: Puckering is rare. The key is for the provider to not be overly aggressive and to remove all the fat in an area completely. This takes training, artistry, and experience. A skilled professional will leave the skin smooth and beautiful. THE FACT: Of course, any surgical procedure carries certain risks but modern-day liposuction is extremely safe in the hands of a trained professional. THE FACT: I have chosen liposuction as my body sculpting method of choice. While non-surgical fat reduction methods certainly have their pluses, they often require multiple treatments whereas liposuction only requires one treatment per area. Liposuction also has a more predictable outcome since it can more specifically target exactly what areas of fat will be removed. Please call my office and schedule a private consultation so we can discuss your concerns and goals.